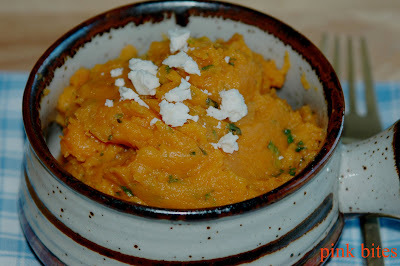 Now.....sweet potatoes are an entirely different thing. They are tastier and the colour makes me want to eat them! I found this recipe at migthyfoods, a great site I visit often to find out about food information, nutrition as well as recipes. 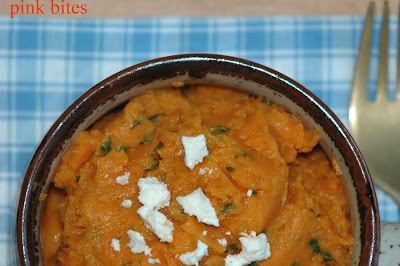 I like the idea of adding lime and cilantro to the sweet potato mash. It balances its the sweetness. I also added some feta on top for extra flavour. This is a very nice side dish, or on my case, a meal by itself, just accompanied by a small salad. Cook the potato as usual (peeled, cubed) in cold water until tender. Drain, return to pot and mash. Add some butter (about 1 tbsp for each potato), mix well. Stir in chopped cilantro and a squirt of fresh lime juice. You can add as much or as little lime as you want. Season with salt and pepper to taste. Top it with some feta cheese. 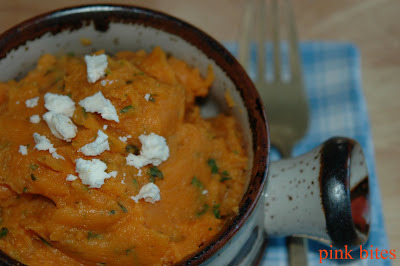 I'l ONLY eat sweet potatoes - it's a texture/flavor thing for me, haha ;0) Looove this mash dish you created! Yum! just learning to cook here really but tried this one out and it was so easy and DELICIOUS! wonderful, thanks!! !